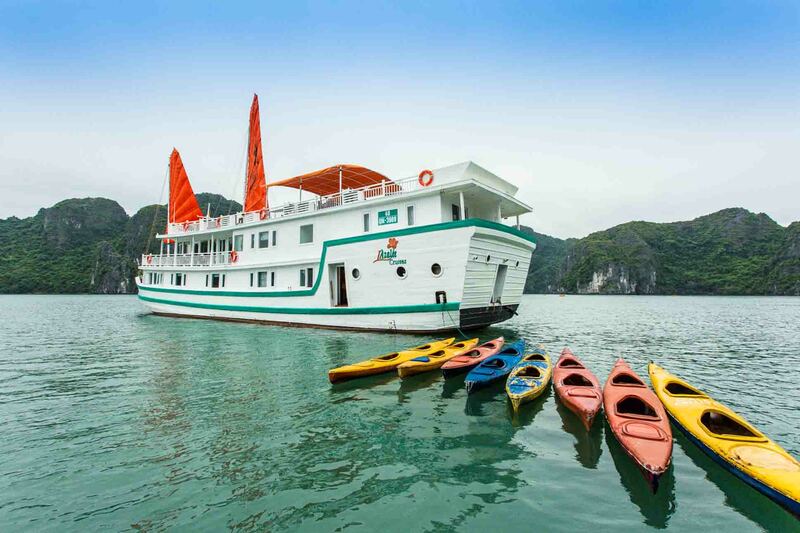 Covered by about 2000 charming islets and grottoes, Halong Bay, which attracts a large number of domestic and international travellers all over the world for its magnificent charm, has become one of the most popular tourist destinations in northern Vietnam. Normally, your journey starts in Hanoi capital city. Private car, shuttle bus and sea plane are three options for transportation service. Note that shuttle bus only picks guests up at a hotel located in the Old Quarter, if you stay at a hotel outside this area it is advisable to take a taxi to Hanoi Opera House and wait for being picked up by shuttle bus. Since the bus has to move around to pick up several ones, the pick-up time cannot be fixed. Meanwhile, as picking up only one group at anywhere in Hanoi then goes straight ahead to Halong Bay, private car is much more convenient. Since you will go pass by famous sites in Vietnam such as Long Bien Bridge and the Red River, travelling by private car or shuttle bus can be seen as an advantage. 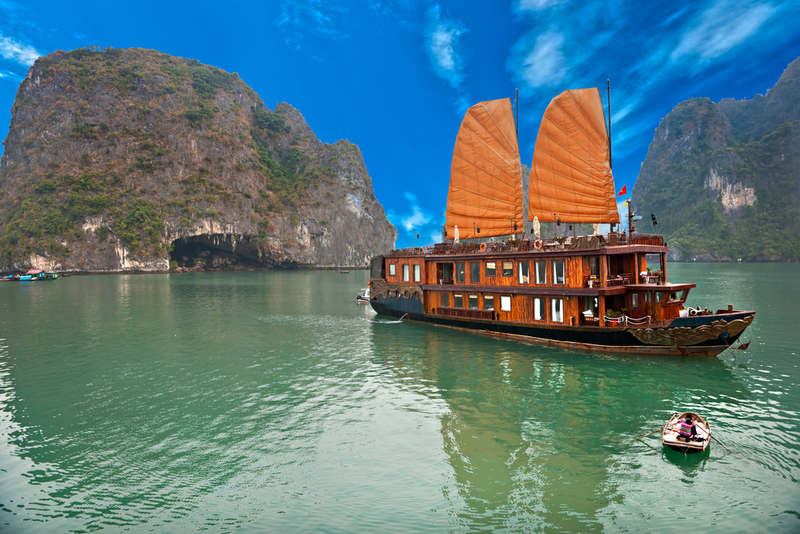 To reach the harbor in Halong Bay (Hon Gai or Tuan Chau harbor), it often takes you around 4 hours. Once getting off the car, you will wait for the check-in time on board, take time for a rest in the waiting lounge and drink some free tea. 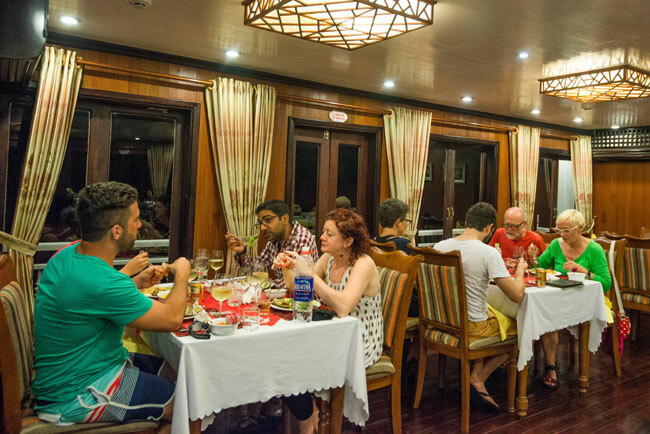 Most cruises start at around 12 a.m. Once getting on the boat, you will be warmly welcomed by the cruise staff, be told about the safety instructions and a brief itinerary for your first day and quickly enjoy your amazing floating trip in Halong Bay. In the evening, in addition to dinner served with fresh delicious sea food in the dining room, in your room’s terrace or balcony as your request, there is also a cooking class in the evening. 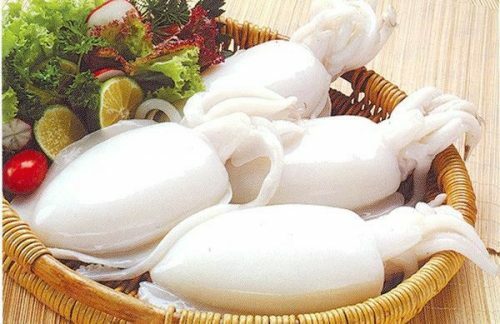 Taking part in this class, you will know how to make Vietnamese spring rolls and sample the dishes made by yourself. 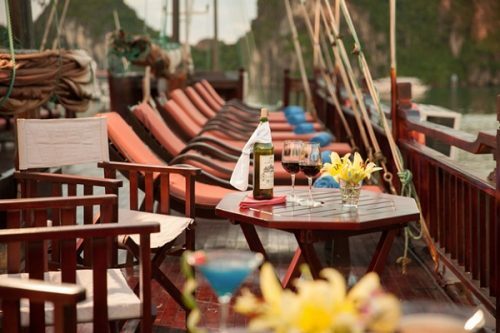 In the late evening, squid fishing activity or lying down on the sundeck for relaxation in the slow melody are what you can enjoy. Your first day will end at midnight and it’s high time got back to your room, got to sleep and prepared for your next coming day. 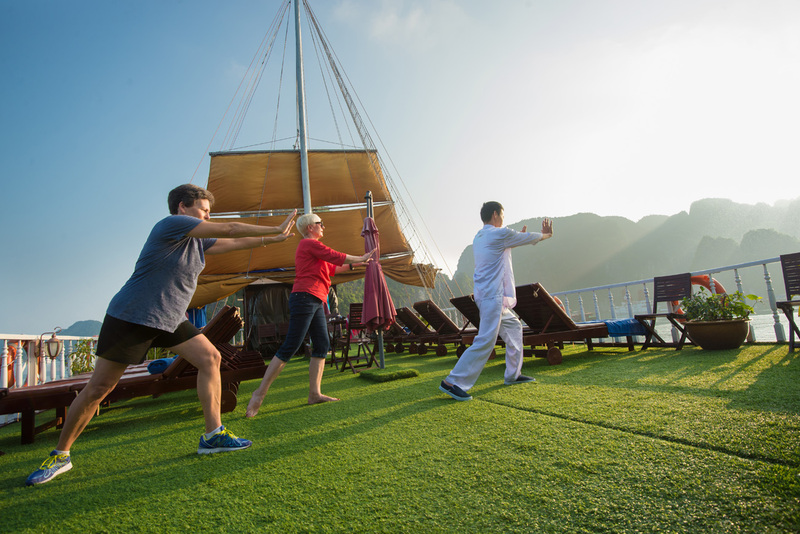 Normally, your second day will start with Tai Chi (or Tai Chi Chuan) class on the sundeck in the early morning. Tai chi is a set of slow controlled movement, which is really good for your health and appetite. If you are not interested in taking part in the class, you can have a cup of coffee whilst breathing fresh air and seeing the stunning sunrise in the bay. Normally, you will be taken to visit famous caves in the areas such as Me Cung Cave, Bo Nau Cave, Sung Sot Cave, etc. To capture memorable moments and magnificent views, remember to bring a good camera with you. 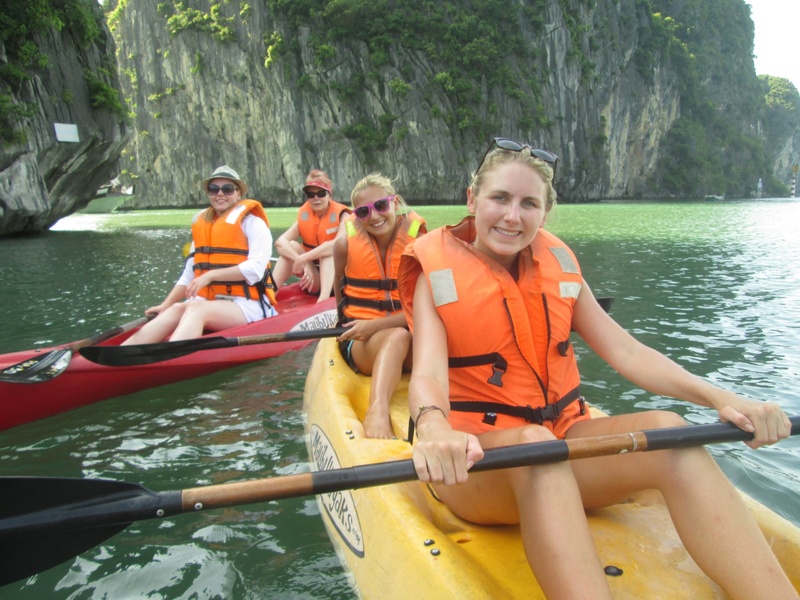 After your trip, you might miss Halong Bay and want to go back many times.